It’s summertime, which means that it’s time to start watching out for wasps. 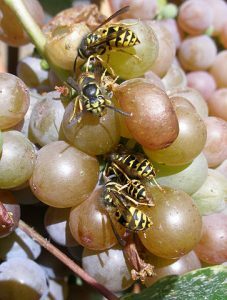 Wasp stings can be painful, and can even be dangerous because unlike bees, wasps can sting multiple times. Here are three ways to keep wasps out of your home in the summer. The number one reason that pests of all kinds find their way into a home is food. Just like ants, flies, and mice, wasps will enter your home in search of food. Avoid leaving open containers of food on your counters. When you are done with the food, seal it up and put it away immediately. This also includes your drinks, so be sure to rinse glasses and dump out unfinished beverages – especially sugary drinks like soda and juice. Do a once-over and check that there are no holes in your screens, cracks or gaps around windows and doors, or unsealed vents. Sealing off these areas will make it harder for wasps to get in. When you see a wasp in your home, your immediate reaction is probably to kill it – but this may not be a good idea. When you squish a wasp, the pheromones it releases will attract any wasps that may be nearby. If there’s a nest of them on your property, this could be dangerous. The safest thing to do is leave it alone and provide it with an open window to escape from. What do I do if the Wasps Get In? Call a Reliable Boston Exterminator. It is important that you do not try to remove a wasp’s nest on your own. A trained exterminator can safely remove the nest, whereas a homeowner without proper equipment and experience could end up getting hurt – especially if you are allergic to wasps. AAA Exterminating is here to provide expert wasp nest removal in Cambridge, MA and the greater Boston area. This entry was posted in Uncategorized on July 7, 2017 . © 2019 AAA Exterminating Company, All rights reserved.